When I first think of globally connected classrooms, I immediately think of various systems I’ve blogged on before like Skype Classroom, Quad-blogging or Google’s Connected Classrooms. But I thought I’d bring you a connections story directly from New Zealand. For me, the important point around global student discussion or in fact, any situation that introduces new perspectives to a classroom topic, is that of depth and what I like to call, messy learning. 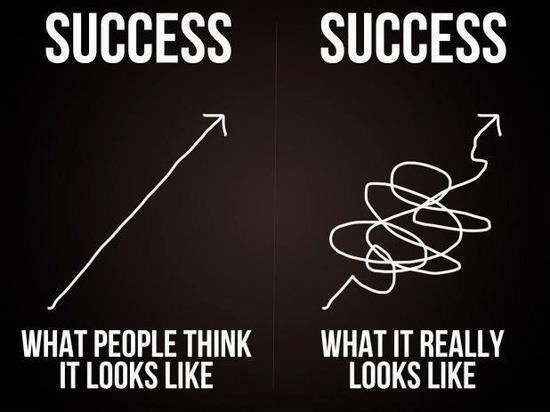 You may have seen this common graphic about success (left). Well, I like to think the same about learning. It is detrimental to education when anything or any person encourages the idea that learning is linear. The idea that at the beginning of learning, you don’t know something and then after following a particular study path, you complete your learning by obtaining said knowledge. True deep learning is a social exercise. Multiple perspectives are always required if a true understanding is to be achieved. Perspective that won’t necessarily become apparent unless you involve other people in the journey. If we start young, how do we ensure safety? This is where I would like to introduce you to a kiwi called Stephen Baker. For two years, Stephen has run a hugely successful classroom Twitter chat every week on Wednesday afternoons. When I say successful, I really mean it. Over 230 elementary classroom accounts have been involved, and remember, New Zealand only has a population of 4 million! The chat can be found on Twitter under the hashtag: #KidsEdChatNZ and has it own account and also a website. What does good problem solving look like? Should you be able to use Minecraft in your School/classroom? Convince us! How can it help learning? How do your School’s values impact on your learning? Can you think of any problems that you could solve with coding? Although this is a national initiative, #KidsEdChat has introduced thousands of children as young a five, to a world of online connections and the learning and impact those connections bring about. They also get to see online discussion in the context of a real social media platform safely monitored by the classroom teacher. Why not a #KidsEdChatGlobal? To have students discuss their learning and reflect on each others perspectives could have similar positive outcomes to our home grown equivalent. The question is, will you be the teacher to start it? Presenter and also a father to 2 beautiful girls. Next Teacher, you’re more important than you think.